Universal education for developing countries through text messages! Jon spent a month in South Africa visiting schools and noticed the poorest schools had literally no resources—no textbooks, no lab equipment—but everyone still had a smartphone. Therefore if we can leverage mobile technology, such as text messages and Facebook Free Basics, we can deliver quality education using an existing, established infrastructure. This will be quick, cheap and effective to deploy. TxtEd allows anyone to receive individualized education through text messages. They can receive material and quizzes via text messages, regardless of their socioeconomic status. We use artificial intelligence to scale the level of content according to the user’s performance, so that every student can learn effectively at their own level and pace. 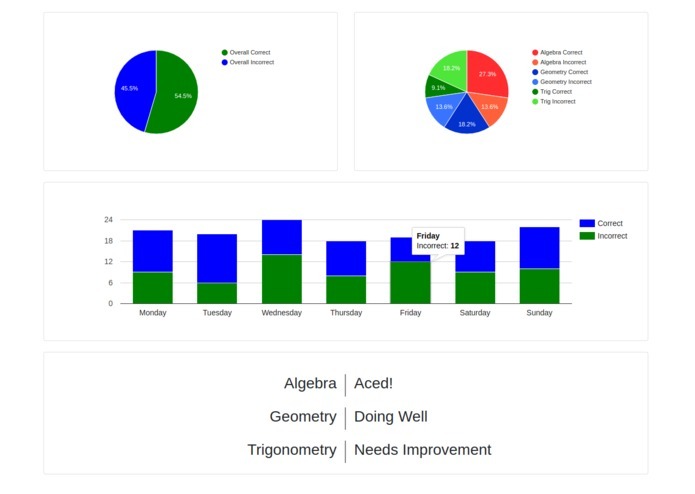 We also provide progress reports for the students and other stakeholders, such as parents, teachers and guidance counselors to track students’ progress over time. We used Twilio API to interface user input and our algorithms via text messages. We used MongoDB as our backend database on an AWS EC2 instance. We used Wit.ai for natural language processing to improve the user experience (UI/UX). The server is based on node.js, express.js, and nginx. For our frontend progress reports, we used socket.io to establish a seamless, real-time synchronization between the client browser and the MongoDB backend. We also used Google Charts for easy data visualization. Finally, Bootstrap makes sure our client-facing web portal is responsive. Facebook disabled their Messenger chatbot because of the recent Cambridge Analytica scandal, so instead of delivering both Facebook Messenger and Twilio, we focused just on Twilio. We also had difficulty finding a seamless connection between our frontend and our backend, because none of us knew socket.io well. 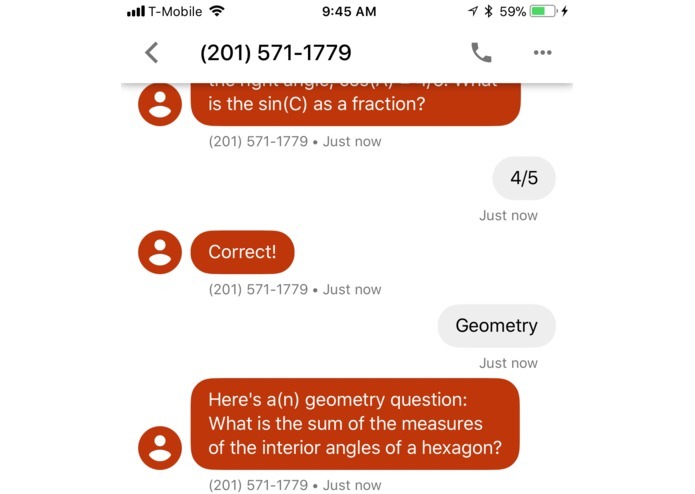 Additionally, we wanted to use the Wolfram Alpha Pro API to send problem explanations via text messages but we couldn't afford it. For most of us, this was our first hack, first use of the Twilio API, MongoDB, Wit.ai and first chatbot! We are proud we were able to pivot once we realized Facebook disabled their chatbot feature, even though we found out about it Saturday night. A whole bunch of technical skills we didn't know before! Expanding our database of questions so that we can deliver more than just math education. Integrating the wolfram alpha pro API so that we can send explanations to the answers that we send. Interfacing with other common communication platforms in developing countries, such as Facebook Messenger and Whatsapp. Tracking progress beyond algebra, geometry and trigonometry to include other topics in math education. Expanding our ranking system beyond just “Needs Improvement,” “Doing Well” and “Aced.” Using more sophisticated AI algorithms to better individualize the questions and content we send. I worked on the configuration of a business chatbot using the Facebook Messenger API. My team faced unprecedented limitations with Facebook; however, I hope to implement this in the future! I instead assisted in the implementation of the Twilio Messaging API to simulate a chatbot. 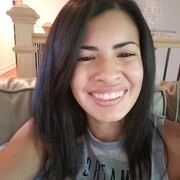 Bright-eyed, ambitious student not afraid to gamble and advocate for new ideas with a passion for building with code to be the change!